Sorcerers, savants and theologians of the Petitioner of Clouds, the Aspects of Air are the intellectuals and magicians of the Dragon-Blooded Host. Yet, these formidable Exalts are far more than scholars. With their deadly intellects and devotion to the Dragon of Strife, Aspects of Air are some of the Hosts deadliest warriors. Foolish are those who fight against the wind. 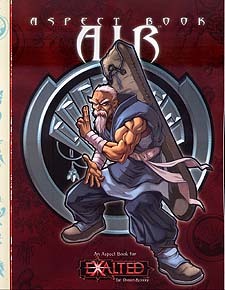 Aspect Book: Air is the first Aspect book for Exalted - books detailing the different aspects of the Terrestrial Exalted. Herein are told stories of five members of the aspect, from those who have just graduated secondary school to the musings of the venerable Tepet Arada. This book also contains new Charms, rules and artifacts that Air-aspected characters need to claim their roles as sorcerers and soldiers of the mind.